out like a peninsula into the lawn area. I'd pulled a small red maple tree (Acer rubrum) from the edge of our front pond. It was in a place where another tree would not work well, but when I pulled it, all its roots were still attached in a blob of mud. 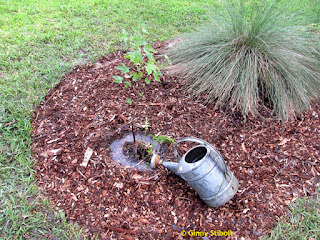 I stuck the tree in an empty pot near the rain barrels. Over the next couple of weeks, it seemed to be happy in the bottom of the pot with just occasional splashes of rain barrel water. I didn't know what I was going to do with it, but its presence there reminded me to do something every time I came to that side of the garage with the rain barrels and compost piles. I had a thought when I was cleaning out the long garden that used to back up to a fence, but when we gave away the fence, this bed jutted out into the yard like a peninsula. Placing a tree at the end of this bed would eventually provide an anchor. 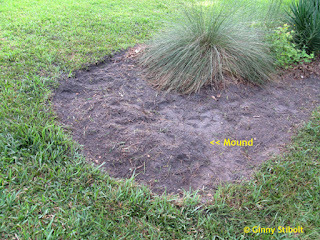 It will also eventually shade out the nice muhly grass, but it will be years before that happens. When I considered where to plant the maple, I decided to extend the former fence garden. 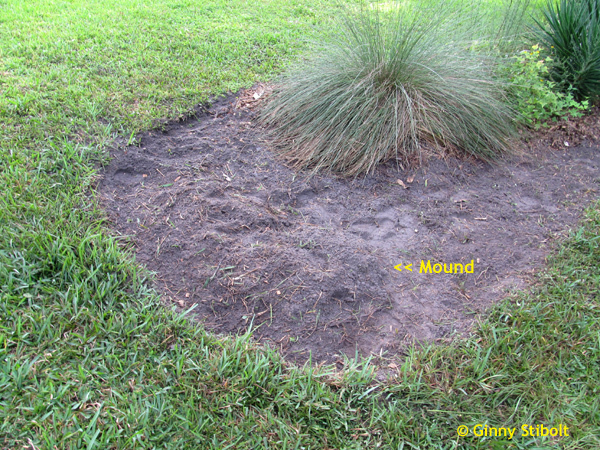 There had been a relatively deep swale just at the end of this garden, so I built a mound on top of the swale. 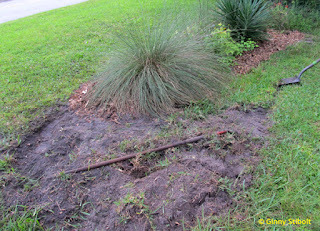 The low spot off to one side of the end of the garden often collected water after hard rains. The maples don't mind wet feet, but I built a mound on top of the swale so the root flare of the tree would stay higher than the surrounding area. Studies have shown that trees planted high like this do better in the long run. Then I placed the pot with the tree in the proposed planting spot and took some time looking at this placement. I walked along the street and I went inside the house to see how it looked from there. I tried to picture what it will look like when it matures. Judging the location of the tree, from all sides. This tree will make a good anchor for the peninsula. When I was satisfied that this spot would work for us, the infrastructure, and the tree, I planted it. 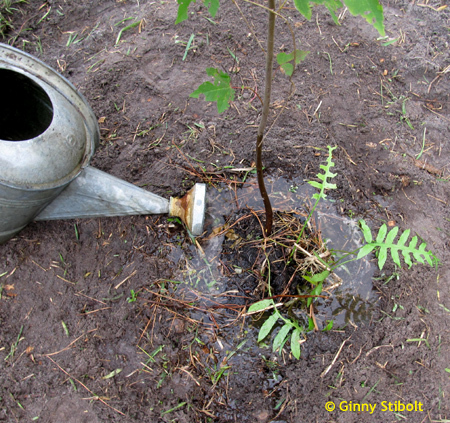 Now since this is not a container grown plant , there was no need to rinse its roots. I'd left the ferns and some other plants with the tree. Time will tell if the fern will survive here. If it doesn't, I'll add some when the tree is bigger and casting more shade. 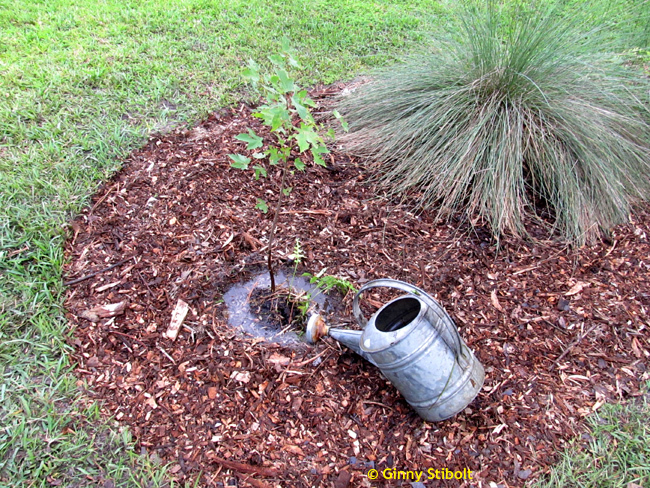 I used three 3-gallon watering cans during the planting process. 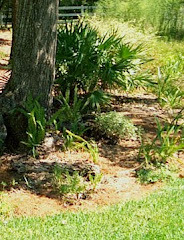 This was a test of the irrigation berm that I'd built around the tree.. 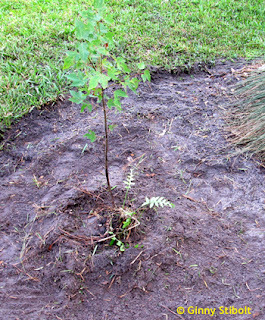 I covered the soil with a 2-inch layer of arborists woodchips, except right near the tree. I watered it with one 3-gallon watering can for the next few days. Then Irma came. This devastating hurricane dumped more than 8 inches of rain over 3 days. We lost 8 big trees out in the back, but no structures were damaged and the neighbor's house was right next to some of these trees--several had trunks that were almost 3 feet. Three trees broke off at 25 feet high, so we think we experienced a microburst. Also,.the power was out for 6 days, but we have a generator that we can use to power a split circuit breaker so we have the refrigerator, some lights, the microwave, induction burner, and computers with Internet. During hurricane Irma, water pooled around the tree. We received more than 8" of rain in 3 days. 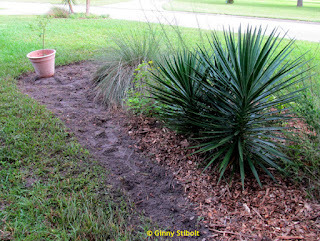 Hurricane Irma also pointed out the other swales in the front yard. 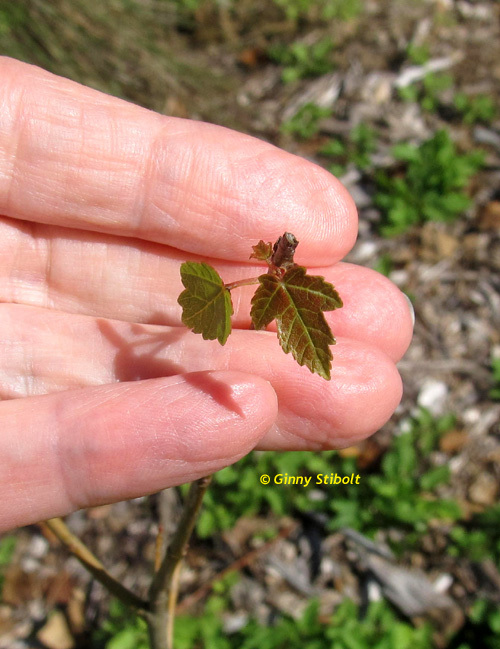 but then it produced these tiny leaves. The maple produced a new set of leaves, but they were tiny. I'll continue to water the tree unless there is rain, just to help it adjust to this drier environment. The fern is no longer showing, but it may come back in the spring. So my plan is to eventually add some shrubs around the tree to add some layers and this will mean more lawn retired from use and more cool bird habitat. I look forward to seeing it grow well here. So when you plant a tree you believe in tomorrow. Another tree saying is. "The best time to plant a tree is 20 years ago, but the second best time is now"
I hope you have an eye on the future also when it comes to climate change, because trees make a big difference. They cool the air; they send moisture into the air to keep the rains coming, and they store carbon. I wish you a happy and greener New Year in 2018. 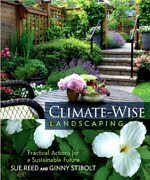 "Climate-Wise Landscaping: Practical Actions for a Sustainable Future" by Sue Reed and Ginny Stibolt. 2018 Click the image to order. "A Step-by-Step Guide to a Florida Native Yard" with coauthor Marjorie Shropshire. 2018. To order a copy, click the image. 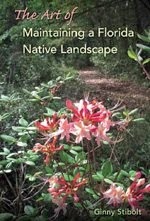 Please click on image to order "The Art of Maintaining a Florida Native Landscape." 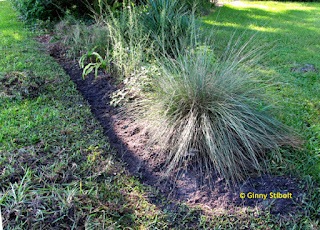 Please click on image to order "Sustaianble Gardening for Florida" on Amazon.com. Please click image to order my book "Organic Methods for Vegetable Gardening in Florida." Green gardeners remove turf near trees. 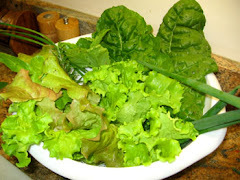 Green gardeners enjoy organically grown produce. 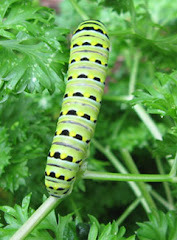 Green gardeners will plant extra parsley or dill for the black swallowtail larvae. 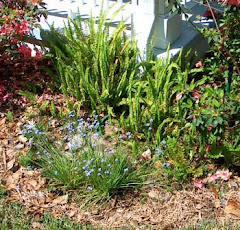 Green gardeners build rain gardens to absorb rainwater. 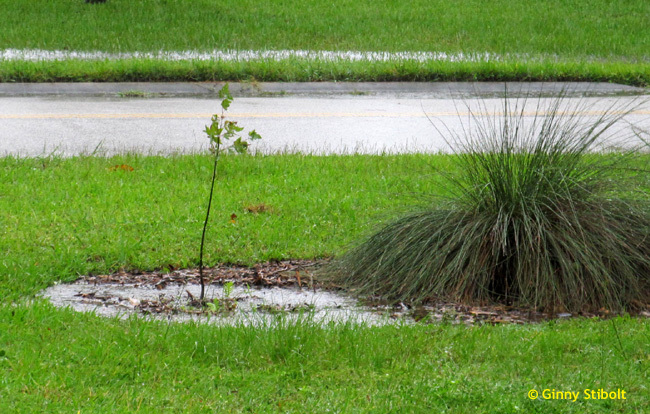 This small rain garden catches runoff from a downspout. 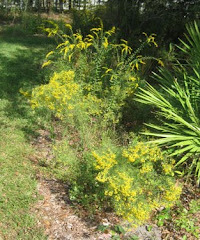 Green gardeners attract native bees with good habitat and native plants. 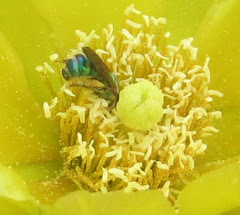 A blue bee dives into a prickly pear flower. 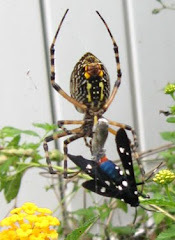 Green gardeners encourage the predators in their yards. 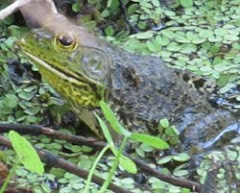 Green gardeners install water features for frogs and dragonflies. Green gardeners use more native plants in their landscapes. To go to the Transplanted Gardener website, click the graphic. The old garden log entries, links to the podcasts, and to the archived articles are still there. 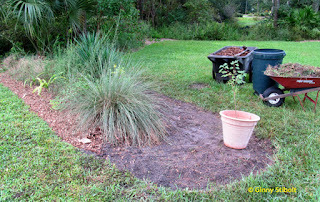 Like Sustainable Gardening for Florida Facebook page. © Ginny Stibolt. Simple theme. Powered by Blogger.